It’s a week since we left home, and a lot has happened. What continues to impress me is the diversity of our clubs. In Coonamble, the club is led by a very young president and secretary, Emily Ryan and Rhys Kable – a dynamic duo. And they have a couple of young women in their club who also blend with their older members very well. In fact, one older member commented on the fact that they have been good for the club; given them some ‘spark’. This area is in drought also, and we stayed with Keith and Lois Cain on their property about 16 kms outside the town, where their fields lay dormant, and will continue to for the next year or more until the rains come. And do you know, when the rains do come, they flood the plains, and it renews their black soil land – this whole region is the bread basket of our country; our wheat and barley, sunflower and chickpea; our cropping areas. 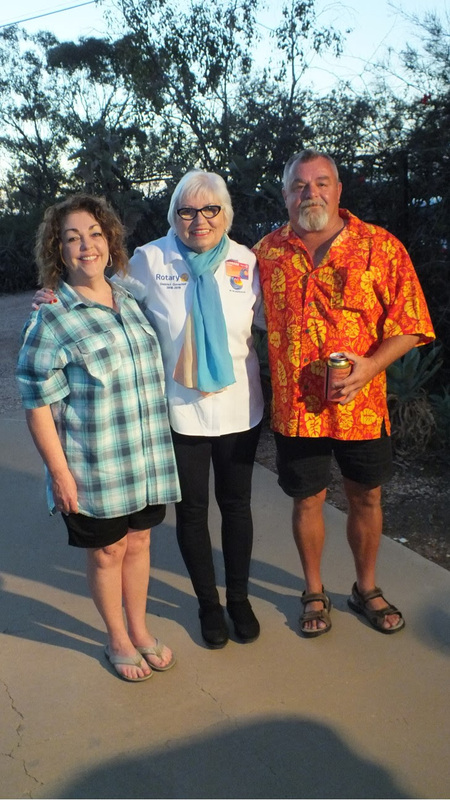 Lightning Ridge President, Kerry Adamthwaite and his wife Barbara. Our next stop was Lightning Ridge. I had huge expectations of this club, and they didn’t disappoint. “We’re very laid back and casual out here”, I was told. Their meeting was held on a Saturday (so everyone could attend) and held at the home of AG Neroli Bevan and her husband John, with whom we also stayed. There are so many ‘husband and wife’ club members in Lightning Ridge; impressive. And I inducted the wife of a member, who came along to the event in the outfit her husband had worn the year before, when he became a member. Known for his ‘loud shirts and shorts’ year-round, Jane certainly caused a ripple of laughter in the crowd – what a hoot. Another member of their club, a farmer who runs cattle on her property, is also a member of SALT (Supporting and Linking Tradeswomen). You might have seen them at the Conference in Laurieton. These women go out and give a hand on properties where it is needed. I discovered that ‘Spooner’ (as they call her) is a NEGS ‘old girl as well. NEGS is a boarding school in Armidale. So, we had this wonderful BBQ, with home- made spring rolls as a starter, made by a member who is originally from Thailand. 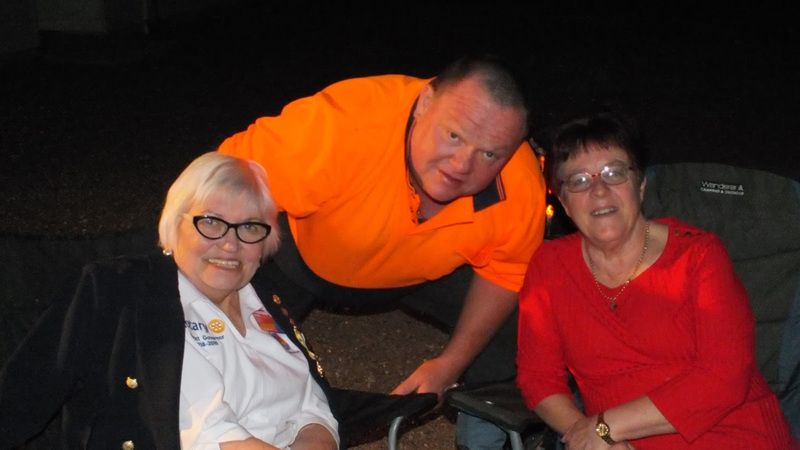 AG Neroli and John Bevan by the campfire in Lightning Ridge. If you haven’t been to Lightning Ridge, it is a unique part of the world. The Bevans have a Cactus Garden, which has been in John’s family for 60 years, and he also sells black opals. The Cactus Garden is a real tourist attraction, and has been featured on the Better Homes and Gardens show (they have the team’s comments in their Visitor’s Book to prove it). And the famous artist, Jon Murray, whose work can be seen all around the region, has a Gallery there and lives in the town. It is the place to find opals of course, and I resisted the temptation to walk into any of their jewellery shops. And if you want to see emus in the wild, this is where you will find them. We discovered an emu and his chicks near the Artesian pool. It seems that once the mother emu lays the eggs, her job is done, and the father emu takes over. He sits on the eggs and rears the chicks. How good is that girls? We are now in Moree, and having a rest day before we meet the members of the two Moree clubs. I took the opportunity to try the Artesian Hot Springs here, and wow, do they feel good. The Castlereagh River runs through the region. Amazingly, when it runs, the water comes from rivers to the north, and it comes down in an almighty force to become the fastest running river in Australia. Hard to imagine, looking at it now, and it supposedly runs in all directions of the compass. As we drove along the dry plains, seeing the flood level markers at the side of the road seemed almost incongruous with the miles of barren fields. Our farmers remain eternally faithful to their land, in the knowledge that the rains will come eventually. They are an amazing lot – the backbone of our country. The club plans to resurrect their ‘Yesterday’s Heroes’ Ball on a Saturday that coincides with their Races on a Sunday, and turn the proceeds to their drought appeal; they have plans to invite the Premier as well. And they talked about the 2002 flood, where they had a huge event to help people affected by this as well. Mackellar’s ‘Drought and flooding rains’ holds true in this part of the world. Everyone brought something - the salads and desserts were truly fantastic, and we all had a great evening. 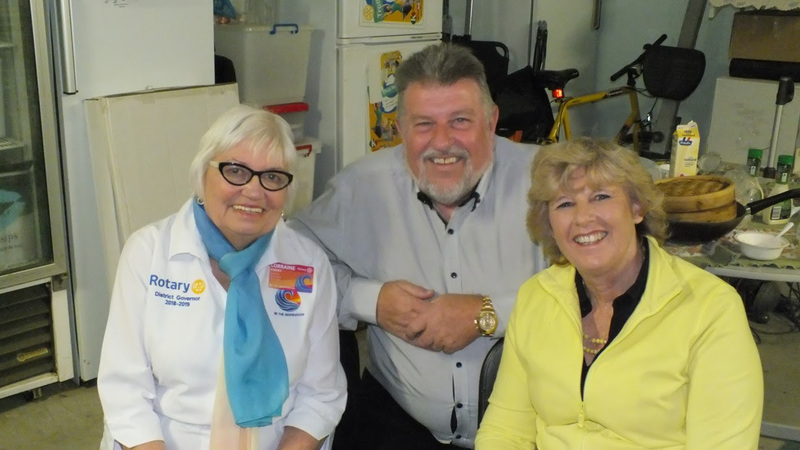 How good is it when Rotary Clubs support each other? The club was recently given a donation of $3,000 from a club in Lismore. 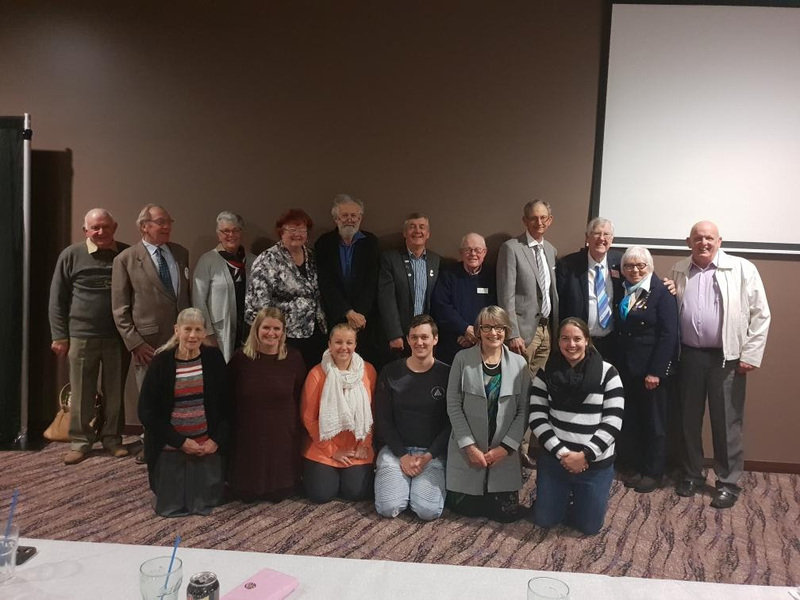 When Lismore was affected by a flood, the Lightning Ridge club send them a donation, so Lismore was returning the favour – acts like this truly warms the heart. They went out and bought Dog biscuits and washing powder with the money, and delivered it to the farmers in their region. What a practical way to dispense ‘the love’ coming from the Lismore club. We talked about the question on everyone’s mind about how we distribute the funds to those who need it. In small communities like Lightning Ridge, the farmers are known. Suggestions like ‘paying the Telstra and Electricity accounts’ were practical ways to help. If it was money we were giving, the advice was to ‘give it to the women’, as they handle most of the accounts. The names of ‘Rural Financial Counsellors’ keep popping up as people who would know those who need help. And our SALT women are there to help as well. Report from Coonabarabran. 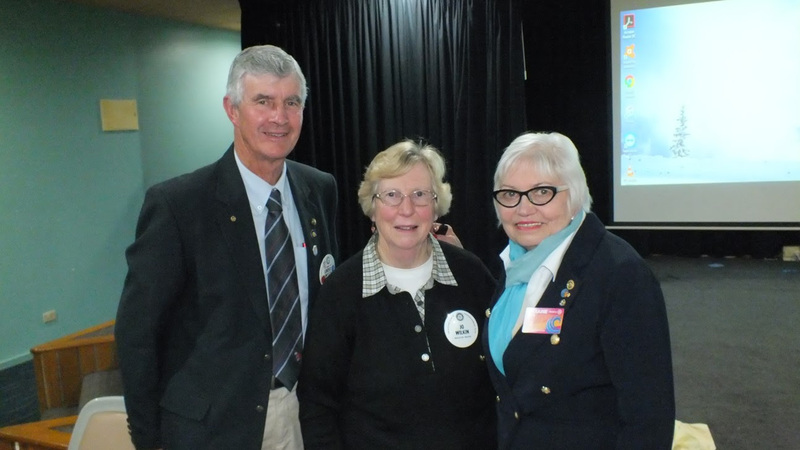 Their Drought Catchup evening was a great success, with over 200 in attendance. They gave out hampers and over 60 debit visa cards valued at $100 each. Everyone enjoyed the evening, the company and the entertainment. Well done Coonabarabran. A big thank you from Dennis and I to all our club members and home hosts who have welcomed us to their corner of our District, and to their homes. We have enjoyed the experience very much. To me, it is the best part of the Governor’s job; meeting all of you and getting to know your region – there is so much more in store! Until next week.